WASHINGTON, D.C. -- Since hitting a 12-year high of 38% in June, the percentage of Americans who are satisfied with the way things are going in the U.S. has remained near that same level, with the August reading coming in at 36%. Satisfaction was closer to 30% at the start of the year and averaged 27% in 2017. 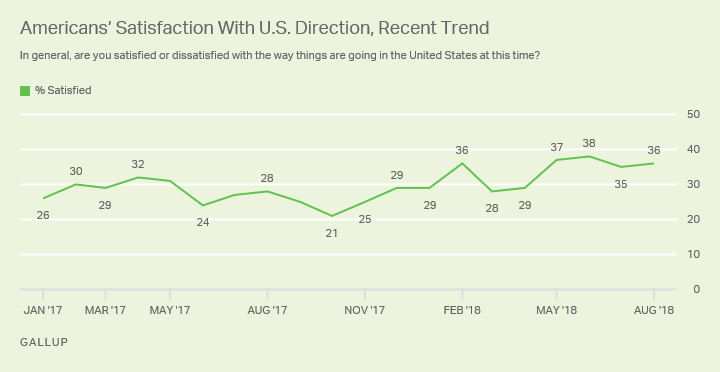 August marks the fifth time so far in 2018 that at least 35% of Americans have been satisfied with how things are going in the country, the most monthly readings at that level in any full calendar year since 2006. Aside from the 2018 ratings, today's 36% is also higher than any individual rating since 2006, except for a single 37% reading in November 2016. That occurred the week before the 2016 presidential election when Democrats were especially satisfied -- most likely reflecting their optimism about Hillary Clinton's chances in the impending vote. On a broader historical basis, the current satisfaction level comes close to the average 37% for this trend since Gallup first began measuring it in 1979. The higher readings this year -- which possibly reflect positive economic news, such as a lower unemployment rate -- also mean satisfaction has averaged a relatively high 34% so far in 2018. While confidence averaged 60% during the economic boom years in the late 1990s, from 2007 through last year, it averaged as low as 15% annually and no higher than 28%. Per usual, there are substantial differences in U.S. satisfaction by political party, with members of the president's party significantly more satisfied than independents and members of the opposing party. Republicans are largely upbeat about the nation's direction: 67% are satisfied and 32% are dissatisfied. 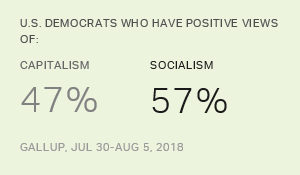 Democrats, meanwhile, are more unified in their displeasure, with 88% dissatisfied and only 12% satisfied. Independents tilt more in the Democrats' direction: 67% dissatisfied and 31% satisfied. Today's 55-percentage-point difference between Republicans' and Democrats' satisfaction with the country's direction is similar to the party gaps in several other months this year. It is wider than at most points throughout Barack Obama's presidency from 2009 through 2016, but not unprecedented. From 2004 to 2006, after the start of the Iraq War during George W. Bush's presidency, the party gaps in satisfaction were routinely as wide as or wider than they are today. Partisan differences were much smaller during Bill Clinton's presidency, from 1993 through 2000. 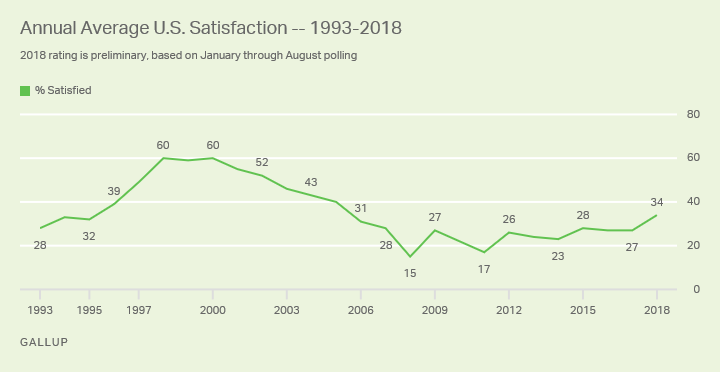 Americans' satisfaction with the direction of the country had improved to the mid-20s from 2012 to 2017 after hitting a low during the 2007-2009 recession. But after leveling off at about 27% the past two years, it has jumped into the 30s and is now hovering near the highest level seen since 2006. Most of these gains can be explained by Republicans' increasingly upbeat outlook during Donald Trump's presidency, while Democrats' optimism has remained flat and low. 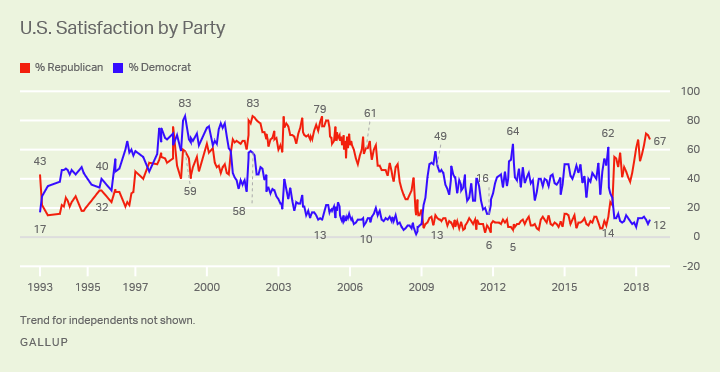 Republicans are now about as positive as they were during much of the Bush years (2001-2008) while Democrats are about as sour as Republicans were under Obama.